Only Until Midnight, Thursday April 18th!!! Suitable for: Coffee Enthusiasts, New Bartenders, Working Bartenders, Cocktail Enthusiasts. 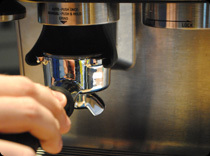 Now you'll be able to create gourmet coffee beverages like a professional Barista. This interactive tasting workshop starts with coffee regions of the world, and teaches you how to choose a bean to suit your tasting preferences. From mild to bold, and bitter to sweet, this class will cover everything that is coffee. You will learn and master techniques to grinding, pulling, and pressing the perfect shot of Espresso. Learn which milk varieties create the thickest micro-foam so you can make stunning layered European beverages. Top all of this with gourmet garnishes and beginner latte art techniques, and you will be well on your way to java bliss.